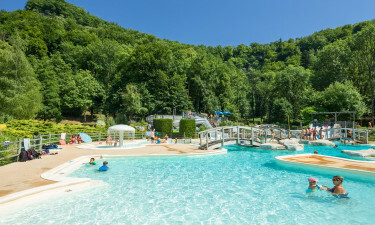 Domaine de Chalain is set in amongst stunning natural beauty, making this the first choice for nature lovers who want to enjoy a camping holiday that they will remember forever. That’s not to say this resort is just for lounging under the sun – those who like to be active while they are away will find that this leading LUX-camp is also packed with plenty to keep the whole family occupied including an excellent water park and plenty of evening entertainment options. What Makes Domaine de Chalain So Special? If it’s water activities you’re after, you will love spending time at Domaine de Chalain. Guests can hire peddle boats to use on the lake, which is a great way to unwind on a sunny day. The onsite water park is also extremely impressive. 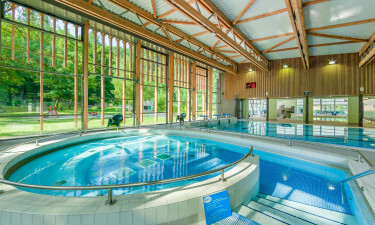 This luxury camping site features a large spa, where guests can take their pick from a large selection of modern spa treatments such as massages. The spa comes complete with a sauna where guests unwind for a while as well as a family sized hammam that offers an excellent bonding experience as well as a good place to soak away aches and pains. For those in seek of an adventure, Domaine de Chalain will not disappoint. An impressive aerial walkway winds its way through the trees and offers guests a bird’s eye view of this enchanting area, while there are numerous opportunities to play tennis, table tennis and miniature gold on the dedicated course while spending the day at this luxury campsite. A full range of sports equipment is available to rent at Domaine de Chalain as well as bicycles so that the family can have fun riding through the countryside together. Those who prefer something light can take their pick from the fast food favourites served at the snack bar. A special evening entertainments programme is also organised at Domaine de Chalain to ensure that guests will never experience a dull moment here and this entertainment is suitable for all ages. This luxury camping facilities boasts a large selection of shops for people who want to browse for bargains and search for souvenirs to take back home. In amongst this collection of shopping outlets is a large supermarket, where guests will find a good range of food products that they can cook in their mobile home or on the grill outside if they prefer as well as freshly baked French bread, which is sure to satisfy.